I'm interested in a low-cost or open source solution for creating land cover GIS layers that utilize both spectral and textural extraction algorithms. I have used PCI Geomatica, ENVI, and Feature Analyst VLS in the past; however these solutions are a bit beyond my price range, any software recommendations? You can use GRASS GIS for this which supports texture extraction and image classification based on a radiometric/segmentation approach. For an idea, check this conference abstract, a planned talk at the Geoinformatics FCE CTU 2011. See also: http://grass.osgeo.org/wiki/Image_processing and http://grass.osgeo.org/wiki/Image_classification for an overview. 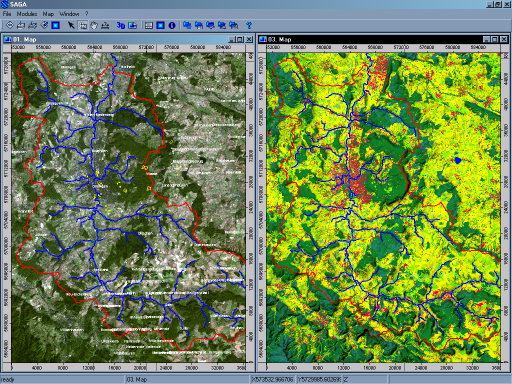 As an alternative you could also look at saga (I'm not saying it is better, I just know it better myself), which also plays nicely with qgis and R. There are some video's demonstrating this on this site: http://www.uni-koblenz-landau.de/landau/fb7/umweltwissenschaften/landscape-ecology/Teaching/geostat (download the datafiles to get the presentations). There is a lot more to say, you training sets should be representative for your study area (perhaps it would even be better to generate random points in R and to classify those). You should also choose your auxiliary datasets carefully, and you might want to generate new ones if eg texture is an important property. You would be able to do that with GRASS. I will point you out to that tutorial. See the raster part. You will use r.mapcalc and r.reclass to extract desired features. r.to.vect will permit you to vectorize your data. Finally you will manipulate vector data. v.db.select and v.class will help you. Not the answer you're looking for? Browse other questions tagged open-source-gis remote-sensing classification feature-extraction land-cover or ask your own question. What open source solution would work best for auto extracting features from satellite images? Is there an easier way to edit polygons in ArcMap? Extracting road and building features from raster data using ArcGIS Desktop? How to extract vegetation polygons from Imagery using Python? Polygonize vegetation area from Landsat7 RGB using QGis / Bilko? Extract land cover data from Google Earth?